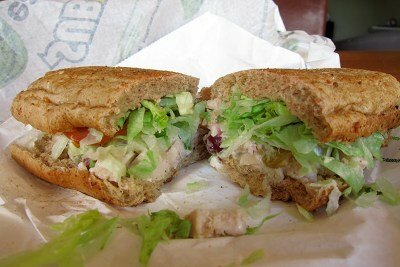 Arby's, Subway, and Chicken Salad: Where's The Grapes? Check out this sandwich! Guess where it is from? No, not my kitchen - this is a professional photo of an Arby's chicken salad sandwich. Notice all the healthy looking elements - lettuce, grapes, apples, maybe a little celery, and whole grain bread! Honestly, I couldn't believe that Arby's - famous for roast beef on bread - could create such a sandwich. How did I learn about this sandwich? Well, Arby's contacted me with an offer of TWO free chicken salad sandwiches to do a taste-off. Yes, they sent me a gift certificate to both Arby's and Subway and asked me to compare the products. There is nothing Snack Girl likes better than free sandwiches. Also, I thought I could see if these healthy offerings live up to their hype. Holy bananas, Batman! What happened to all those lovely grapes and apple bits? The taste was very good, but it lacked all those apple, grape, and celery chunks that I was looking forward to - also, mine didn't have one pecan in it. They make it at the store so I bet they vary quite a bit. This tasted very sweet - they use sweetened dried cranberries - and frankly they didn't work. This also lacked much celery or apples, and the chicken was tasteless. Also, the bread was soggy and the lettuce wasn't as nice as Arby's. Don't you dare eat an entire Arby's or Subway Footlong in one sitting unless you are a construction worker. These portion sizes are seriously out of control. On average an adult is supposed to eat about 2000 calories per day. You are already at 840 and you haven't even touched that 24 ounce Coke yet. Now that you have put away half of your Arby's sandwich until tomorrow - umm, why is there so MUCH mayonnaise and chicken and so few fruits and veggies? This sandwich does not look as advertised and while it tasted great - it needs more of the healthy element that we were promised in the promotional photo. Subway's sandwich is making up for its lack of fat (good going Subway) by an increased amount of sugar (awwwww :(. Notice that it's 6 inch version has 54 grams of carbohydrates versus Arby's 41 grams. You can taste the sugar, and it really doesn't belong in a chicken salad sandwich. Maybe I'll just make my own chicken salad :) Sounds like a great post for Snack Girl. 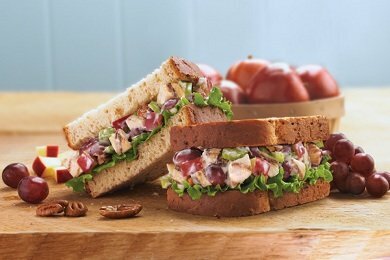 What do you think of these new chicken salad sandwiches? I am sad to say that the bottom line here is -- you just can't eat out and expect restaurants to care as much about your health as you do. It stinks, but this obviously shows they don't care about your health, only tricking you if you are health conscious. Those calorie counts are ridiculous! I tried the Subway version when it was out briefly last year. I couldn't finish it, and not because of the size - it tasted like bad chicken salad someone had mixed candy into. It was dreadful. Great article. Too much sodium, too. Unless an emergency I like to make my own food so that I know what's in it. I try to avoid sandwiches like that unless they are from a small family owned sub shop. The quantity of mayo terrifies me. I love chicken salad but I haven't had any in probably a year. I would rather make my own so I know what is in it. It is sad as consumers the restaurant industry cannot be trusted. Glad I do not live near an Arby's or a Subway Sandwich shop. i've never really been a fan of creamy dressed chicken/tuna/egg salads. i just prefer my meat plain (and then covered in mustard). it seems like it'd be a better idea to mix the meat w/ greek yogurt, celery, & grapes/apples/or cranberries. I had the Subway version last week and the chicken was mushy! I kept thinking that they mixed in some tuna because it was in such small pieces - not at all large chicken pieces like you'd expect in a chicken salad sandwich. I had tried the Subway version last year and never finished it because it was still frozen! Sooo gross! Shame on both Arby's and Subway in deceiving the average consumer in thinking that what they're getting is an alternative to the fat laden, fried foods offered by some other fast foods places. Their's is seriously no better! My favorite and only chicken salad sandwich I will purchase in chick-fil-A. DO you know the points plus amount of the chicken salad at NEWK'S EXPRESS CAFE ? It is byfar the best chicken salad I have ever put in my mouth!!! I was a little skeptical of the pineapples at first, but everyone I've served it to has LOVED it. Give it a try, you won't be disappointed! Wow, talk about false advertising for both of those companies - yuck! The whole appeal of those sandwiches are the crisp apple, crunch celery & juicy grapes. Booo Arby's & Subway! What startles me the most is the number of calories in that simple Arby's sandwich! Major yikes. I can't find an ingredients list anywhere, but I have to bet real mayonnaise must be involved. How else could so many healthy ingredients become such a disaster?